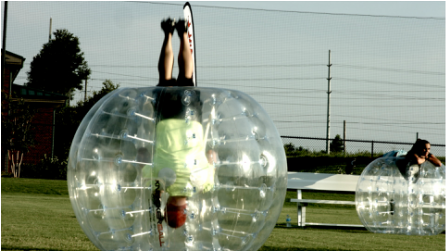 Bubble Bashers' Bubble Soccer is the sporting game taking the recreation industry by storm. Once you try it, you’ll be an instant fan! The bubble soccer equipment we use is durable and light-weight, suitable for a number of playing surfaces, from grass to AstroTurf and even the GYM floor. Interested in renting equipment or hosting an event? Need a referee, 6 or more Bashers balls or a field to play on? Let us know – we’re here to help you out! Additional Basher Balls available upon request! You pick the park or greenbelt or arrange your own indoor venue. 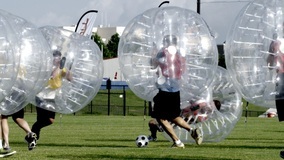 "BEST BUBBLE SOCCER RENTAL IN ARIZONA"
*Renter is responsible for securing a safe bubble area to hold the games and any permits and fees required for the location. Grass/Turf fields and Gyms work best. *All prices include delivery, set up and clean up of 2 different colors of bubble suits for team play, soccer balls, goals, and a Game Master. Because it's too fun not too!!! Buy your own used Bubble Soccer Balls today!!! Our used bubbles are available for sale for $80 each or $75 each for 4 or more. Please contact us for details. Safety: players must always be strapped in properly, play at their own risk and follow player guidelines to reduce the risk of injury.